The image below depicts the amount of partitioning of energy in the United States in 2001. 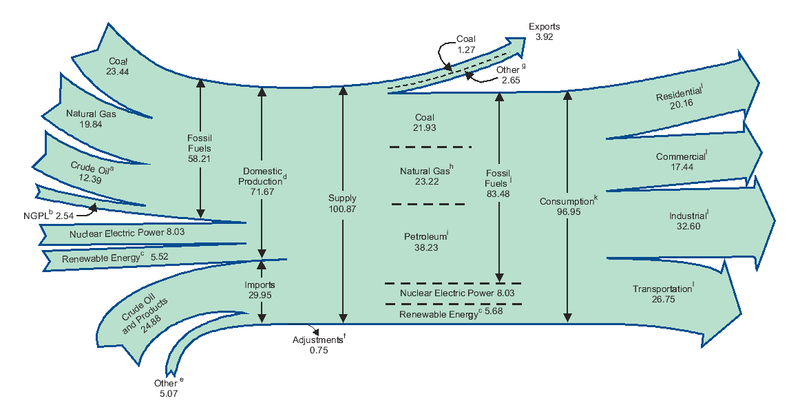 On the left side, the total energy supply is divided according to source: coal, natural gas, crude oil, natural gas petroleum liquids, nuclear, renewables, crude oil and products. In the center, you can see that in the U.S., we rely on fossil fuels for more than 80% of our energy. Some 30% of our energy is imported, and much of our domestic fossil fuel production relies on centralized pipeline and storage infrastructure. Another 8% of our energy comes from nuclear sources which generate dangerous waste with intractable disposal issues. Fossil and nuclear fuels have always carried large externalized environmental costs. Burning oil, gas, and coal creates air pollution at many scales: smog in cities; acid rain over regions; and global warming of the planet. Transporting fossil fuels is a high risk proposition, particularly dangerous for the marine environments affected by oil spills (Exxon Valdez 1989, Prestige 2002). Similarly, nuclear power generation has wide-spread and long-term environmental risks (Three Mile Island 1979, Chernobyl 1986). Reliance on these energy sources also constitutes a profound national security risk! It is unpatriotic to participate in the cycle of gross petroleum consumption and the military, economic, and foreign policies emplaced to protect the supply. The new patriot helps make the transition to energy independence in any way imaginable -- by harnessing renewable sources of local energy (sun, wind, wave, and more) through American technological innovation. On the right side, the proportion of the total energy we use is broken into sectors: residential/commercial, industrial, and transportation. Our new challenge is to envision and realize ways to empower these parts of our society with less dangerous energy sources, more efficiency, and fewer environmental impacts. Note: 1 quadrillion BTU = 7.2 billion gallons of oil (for perspective, 1 billion gallons would fill about 40 non-Olympic swimming pools). Also, if we take 1 BTU = 1055 Joules, then 1 Quad/yr = 30 GW. The salient information to remember is that total energy consumption in 2007 by the U.S. was 100 Quads and about 40% of that was petroleum. Converting to metric power units, the total U.S. power demand is about 3 TW (terawatts) and the power demand for oil is about 1 TW.